Continuing my mission to read all the books I received for last Christmas and birthday by this Christmas and birthday, this was a fabulous read from lovely Lorraine in my BookCrossing Secret Santa parcel. First I just want to share that I reviewed Cathy Newman’s “Bloody Brilliant Women” for Shiny New Books last week: read my review of this excellent romp through about 150 years of lost and notable women here. Thank you again to publisher William Collins for the opportunity to read it. A lovely ex-John Rylands Library copy of a great book which I thoroughly enjoyed. It does what it says on the tin, being a survey of children’s books in the post-war, pre-70s years. Notable for chapter heading quotes by Nesbit’s Oswald Bastable, it starts by looking at the books and authors that come just before the dates of the main text, with a good and thorough portrayal of writing in the Victorian and Edwardian eras and their big blooming in the 1930s. It is from this chapter that the book’s title comes, because the author claims that “No writer for children today is free of debt to [E.Nesbit]” (p. 16). And yes, we can see that she did create the genres that still exist today and definitely did during the period under discussion: the family comedy, comic fantasy, the time theme of historical reconstruction and even the theme of family fortunes and misfortunes, in “The Railway Children”. After this survey of “Foundations”, Crouch takes us on a whirlwind tour of different themes, adventure, sci fi, time travel, comedy, magical lands, the countryside, school, home and family, work and then self and society, which ends up looking at issue-based novels. He takes a survey of the complete period in each chapter, with so many familiar books, and of course some authors popping up in more than one. He also takes care to include overseas authors, which is very interesting, with most of these being less well-known. My only criticism of the book is that it stops too soon – and of course it does, because it was published in 1972! It was hard remembering that a lot of my favourites were published in the 1970s and 80s, so can’t be included here. It certainly made me want to rush back to my Nesbits and Streatfeilds, my Peytons and my Garners, and I was very glad this was plucked from the obscurity of my mammoth wish list. 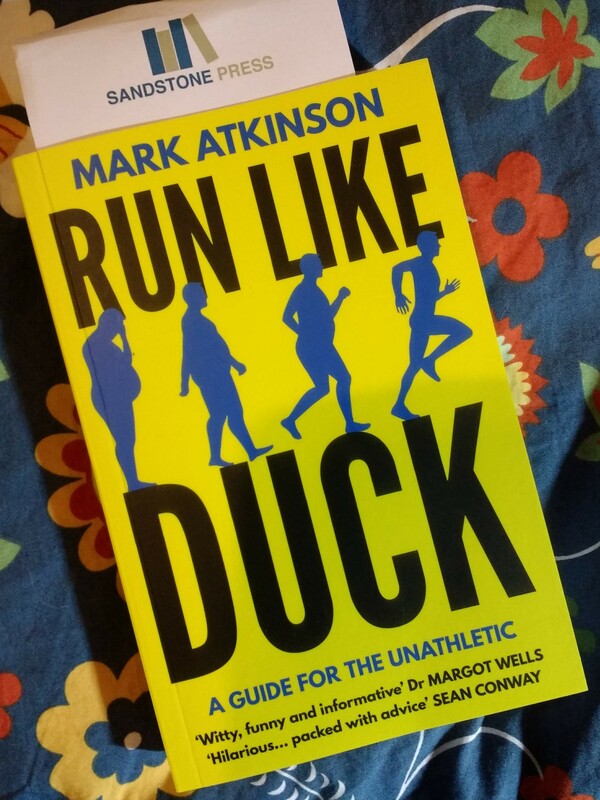 I’m currently enjoying my Iris Murdoch of the month (“A Fairly Honourable Defeat” and I’m having some different reactions to characters than I had last time) and also reading this amusing running memoir, Mark Atkinson’s “Run Like Duck”. However many running books there are, they all have something you can identify with! This is published tomorrow and I’m grateful to the publisher for sending it to me for review and apologise for not getting the review published until after the date of publication (unfortunately work calls me tomorrow so I can’t just lounge around reading all day or even take it for a spin on a static bike at the gym!). The Nesbit tradition sounds absolutely fascinating. Is that the book you got in our Birmingham secret Santa? What a delight. Yes, that’s right, such a treat and a really good read. A keeper for definite! I haven’t heard of Run Like a Duck and when I looked it up, I don’t see that it’s available here in the US. It’s so weird how books work. Even the covers are different on the US and UK versions. I’ll wait for it to come available here! It’s Run Like Duck without an a and I found it on US Amazon under that title. Its’s a pretty good, sensible read so far. My best weird covers thing is the one where Dean Karnazes has a Tshirt on his 26.2 book in the UK version and is bare-chested in the US one! I have this on my “want” list and maybe should purchase for my mother. I like Nesbit but she *really* loves Oswald Bastable! I also love K.M. Peyton and recently finished a Flambards continuation by Linda Newbery. I am still deciding what I thought but at least it didn’t make me run screaming into the woods. Thanks for visiting and commenting! This is excellent and you will both get a lot out of it; it’s a super read. I’m never sure about continuations, and messing with Flambards … hm. I love the sound of this one, a nostalgic trip that will no doubt throw up a new gem previously unheard of, or at least unread. Thank you for mentioning Alan Garner, what a great writer and one who really makes kids (and adults) really consider what it is that they are reading. Yes, this is great and there’s much to explore in the non-UK side for sure. Have you read Alan Garner’s autobiography? I have it on my wish list so hoping it will appear soon!